This is a special issue of the journal dedicated to the 65th birthday of an outstanding Ukrainian mathematician, one of the founders of our journal Professor Vladimir Kirichenko. Vladimir Kirichenko was born on June 17, 1942 in Penza, Russia. In 1959, he graduated from the well-known school No. 107 in Leningrad and entered Kyiv University. He graduated from Kyiv State Taras Shevchenko University in 1964. In 1968 Vladimir Kirichenko defended his Candidate of Sciences thesis “Representations of hereditary, completely decomposable and Bass orders” in the Leningrad Branch of Steklov Mathematical Institute. His teacher and scientific advisor was a famous algebraist Dmitriy Faddeev. 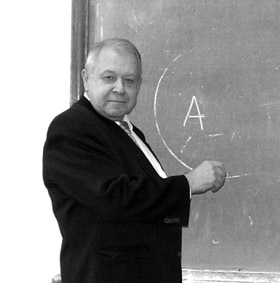 Vladimir Kirichenko defended his Doctor of Sciences thesis “Modules and structural theory of rings” in 1986 in Moscow Lomonosov State University. In 1967-1972, Vladimir Kirichenko together with Yu. A. Drozd and A. V. Roiter developed the theory of Bass and quasi-Bass orders. From 1967 till 1988 Vladimir Kirichenko worked at the Department of Algebra and Mathematical Logics of Kyiv Taras Shevchenko University: as Assistant Professor at the beginning, as Docent (Associate Professor) since 1974 and as Full Professor since 1987. From 1988 till 2006 Vladimir Kirichenko served as the Head of the Department of Geometry at the Faculty of Mechanics and Mathematics. Currently he is a Professor of the same department. Vladimir Kirichenko authored several University textbooks. The book “Finite Dimensional Algebras” (with Yu. Drozd) was first published in 1980 in Kiev. In 1983 it was translated from Russian to Chinese and Spanish. In 1994 an English translation of this book was published by Springer-Verlag. The translation was prepared by Vlastimil Dlab, who also wrote an appendix about quasihereditary algebras. This book is one of the most used textbooks about finite-dimensional algebras in the world. The book “Algebras, Rings and Modules”, Vol. 1 and Vol. 2 (with Michiel Hazewinkel and Nadia Gubareni) was published by Kluwer Academic Publishers and Springer in 2004 and in 2007 respectively. A remarkable novelty of this monograph is the study of semiperfect rings by means of quivers. Another advantage is the study of commutative as well as non-commutative discrete valuation rings. The Volume 2 of “Algebras, Rings and Modules” provides the classical aspects of the theory of groups and their representations, as well as a general introduction to the modern representation theory including representations of quivers and finite partially ordered sets and their applications to finite dimensional algebras. Special attention is paid to some classical classes of rings and algebras including Frobenius, quasi-Frobenius, right serial rings and tiled orders, with an emphasis on quiver techniques. The most important recent developments in the theory of these rings are described. The book studies the Cartan Determinant Conjecture, and gives some prop erties of the global dimension for different classes of rings. The final chapters of explore the theory of semiprime Noetherian semiperfect and semidistributive rings. A very welcome feature is a substantial set of bibliographic and historical notes at the end of each chapter. Vladimir Kirichenko is known not only for his research but also for his devoted service to the Ukrainian mathematical community. He is one of the founders of the biannual International Algebraic Conference in Ukraine (The First Conference was held in 1997 and the last-to-date in 2007). He is also an organizer of the Algebra Seminar in Kiev University, which is one of the most important modern algebra seminars in Ukraine. Vladimir Kirichenko is a very devoted teacher and scientific ad visor. He successfully supervised 23 Ph.D. students and three Doctor of Sciences theses. He has active scientific contacts with algebraists from Belarus, Brazil, Canada, Germany, Moldova, Netherlands, Poland, Russia and USA. In 2007 Vladimir Kirichenko was awarded the State Prize of Ukraine. We warmly congratulate Vladimir Kirichenko on the occasion of his 65th birthday and wish him strong health and many successful years of research and teaching. P. D. Varbanets, E. I. Zelmanov, V. N. Zhuravlyov.